We’re thrilled to introduce Ace Design Expert Julie Richard as today’s guest blogger, who is here to showcase her recent bathroom makeover. 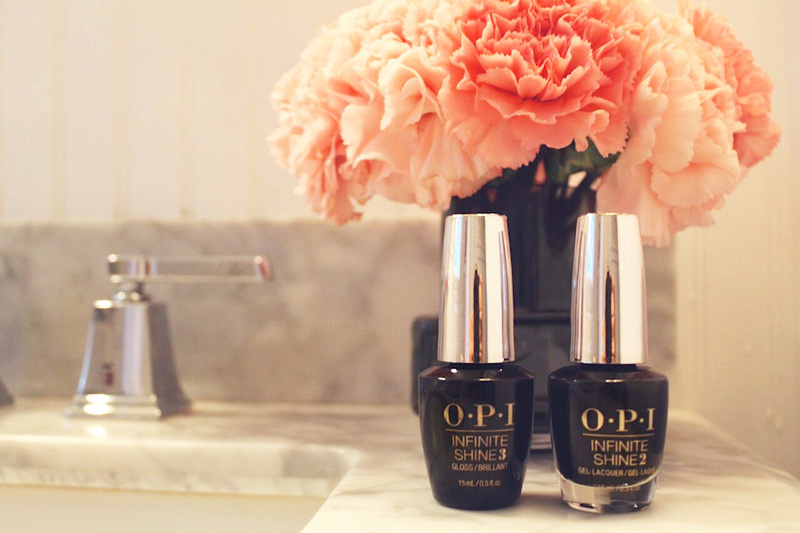 Julie utilized one of her favorite OPI Color Palette by Clark+Kensington shades, Black Onyx, to add a standout, unexpected element to an otherwise classic space in her home. I’m very drawn to classic design with an edge, and it doesn’t get much better when home décor, fashion and beauty come together to inspire! For as long as I can remember, I’ve been painting my nails with OPI nail lacquer, so I was thrilled to find out that Ace Hardware’s Clark+Kensington paint line and OPI nail lacquer launched a collaboration to create the OPI Color Palette by Clark+Kensington. As an interior designer, I’m constantly looking for new and exciting colors in a space, so I love moments when I can incorporate my favorite nail shades into an array of paint colors for myself and my client’s homes. It’s genius – and this weekend was a moment when my favorite polish shade turned into the perfect paint color for my bathroom. I’ve been in the process of revamping my new home over the past two years. It was built in 1972, and was looking tired and dated. My bathroom was close to being complete a few weeks ago, but it definitely needed a few, final design touches to bring the space from bland to edgy and fun. For this space, I was aiming to create a timeless looking bathroom with feminine details and a hint of glamour! 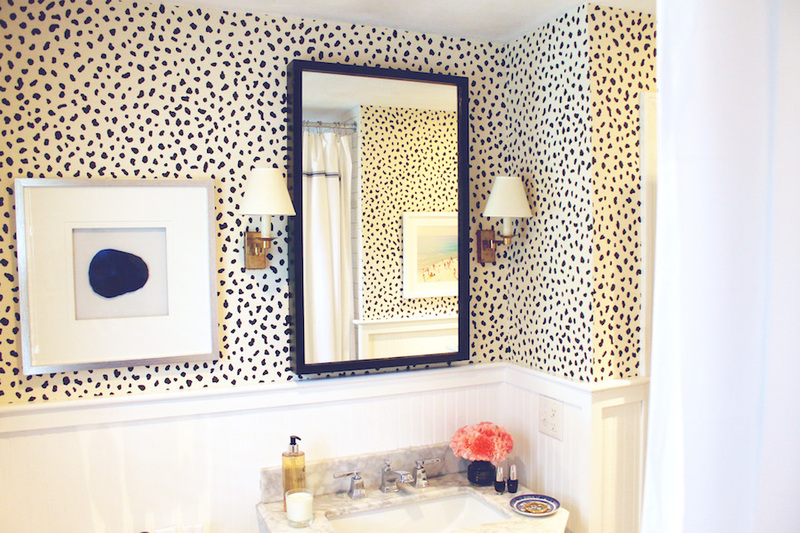 I found this fun, graphic wallpaper I couldn’t wait to add to the space, and added a bit of edge by painting an oversized mirror with the OPI Color Palette by Clark+Kensington’s Black Onyx NLT02 in a high gloss finish. I envisioned using a rich, bold shade on the mirror, with the goal to have two elements in place - fun wallpaper and added drama from the painted oversized mirror - to pull all of the colors together perfectly. 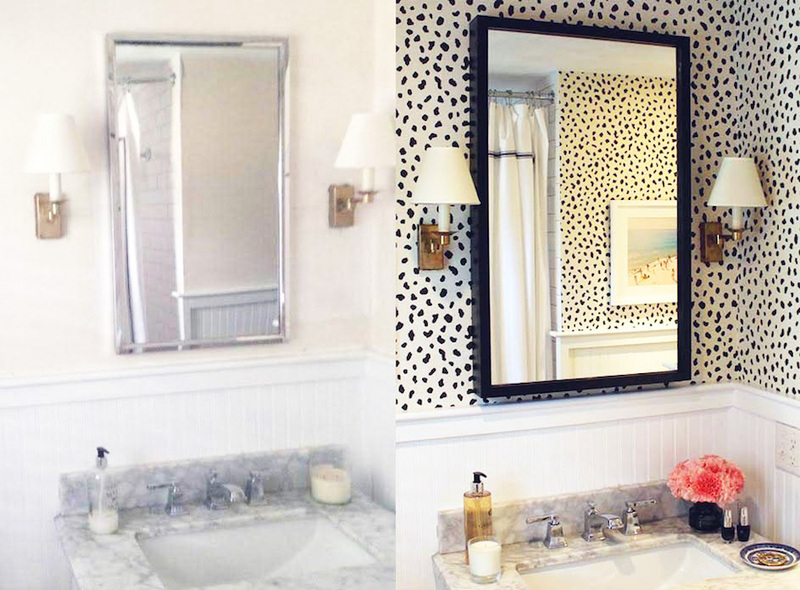 The play of paint off of the wallpaper is amazing, and definitely achieved my timeless yet edgy bathroom look! Take risks on smaller pieces. I chose to paint the mirror Black Onyx because I knew it was a bold choice, and knew that using this deep shade would add something unexpected to this small room. It’s always a good idea to play up contrasts! Try varying your finishes, colors and textures when updating your space. In my bathroom, the juxtaposition of black and white, matte and glossy, and large and small give the room added depth and interest. I think it’s always wise to use neutrals on the more expensive details that are harder to change in a room. Tiles or a large piece of furniture, for example, add color on the smaller items and accessories that can be either repainted or switched out when you are inspired by something new down the road! Change out expected or contractor light fixtures, accessories and hardware. I had a boring, typical mirror in the room before I repainted the oversized mirror that I had purchased at a furniture store a few years back. This simple change truly added a fun element the space! I hope these tips help inspire your own home makeover project. Best of luck creating your own amazing design moments! To find your perfect color in the OPI Color Palette by Clark+Kensington, be sure to head to your neighborhood Ace. Julie Richard is the owner and principal designer for Shelter Interior Design – a Boston-based, full service interior design firm specializing in residential and small hospitality interiors. Over the years, Julie has worked for a number of distinguished high-end interior design firms in the Boston area, working closely with her clients to create fresh, unique environments. Color inspires Julie and paint serves as her go-to recommendation for clients who want to make quick, affordable updates to their home. Ace Hardware, the largest retailer-owned hardware cooperative in the world, and OPI, the world's premier professional nail lacquer brand, have come together to bring OPI's most popular colors to life with an exclusive color palette by Clark+Kensington®, Ace's premium paint line. The alliance between Ace Hardware and OPI is the first-ever collaboration of its kind and combines Ace's expertise in paint with OPI's expertise in color to create the OPI Color Palette by Clark+Kensington.